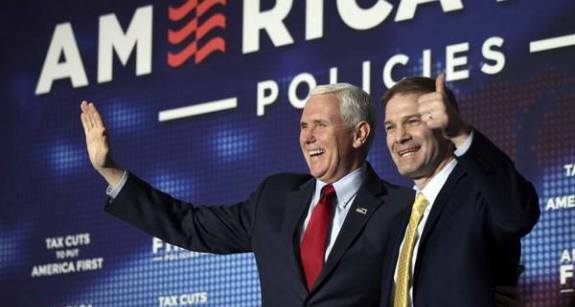 “The president’s got a lot of things done, and we’ve helped with some of that certainly, the regulation reform and the tax cuts, but some of those other big promises we’ve made to the American people we did not get done,” principled limited government constitutional conservative Rep. Jim Jordan told Hill TV. “And they’re not seeing the intensity to get those things done that I think we told them we were going to have. And so that’s what this is all about. The minority leader is all about getting us back in the majority, so we can accomplish for the American people what they elected us to do,” Jordan said. Jim Jordan understands what Speaker Paul Ryan, Majority Leader Kevin McCarthy, Republican Whip Steve Scalise, Deputy Whip Patrick McHenry and National Republican Congressional Committee Steve Stivers never seemed to figure out, or maybe never learned in grade school: Keeping your promises matters. And not keeping your promises to voters will cost you not just their vote on Election Day, but their long-term trust. Establishment politicians like Ryan, McCarthy, Scalise, McHenry and Stivers don’t understand how deep the breach of trust between the existing House Republican leadership and the grassroots of the Republican Party has become. They seem to think that all they need to do is “message” better and things will be OK. Things are long past that, as both the 2016 and 2018 elections showed. The conservative – populist agenda that put Donald Trump in the White House in 2016 also elected the Freedom Caucus endorsed candidates in 2018. Another political imperative of being in the minority that Jim Jordan instinctively understands that seems to have left eluded Kevin McCarthy and the rest of the Republican establishment is that win or lose sometimes the fight is the objective. The Republican establishment has become defeatist; in the minority they will be happy showing up and getting beat two to one and then retiring from the fight until the next vote as long as they get a couple of stop lights for their District in the next appropriation bill. What Jim Jordan has learned from founding the Freedom Caucus is to not be afraid to try to defeat the Left, even if there is only a small to no chance of success. What Jordan wants to do is build a movement and get grassroots conservatives engaged in that movement. We of the New Right understood the lesson of Babe Ruth’s 1927 season. That year the Bambino led the major leagues with sixty home runs, but he also led in strikeouts with eighty-nine. We weren’t worried about how the establishment, the press, and others would view us if we lost. We knew if you expected to hit a lot of home runs, you had to expect to strike out a lot. Kevin McCarthy and the Republican establishment are much more worried about looking good to their friends at the country club than they are fighting for conservative principles and building a movement – especially when the immediate chances of winning are slim. What Jim Jordan proved in founding the Freedom Caucus is that he’s up for the fight, and that is the first and most important qualification for Minority Leader. As we have often said, no voter in their right mind – and polls show the conservative voters the GOP needs to win are more attuned than ever – is going to vote to continue Paul Ryan’s legacy of betrayals, lies and failures, and that’s what Republicans will get if they elect Kevin McCarthy as House Minority Leader. Submitted by charlyc on Wed, 11/14/2018 - 12:04. RINO's like McCarthy, Scalise, Ryan, Corker, Cornyn, Flake, Boehner may call themselves "Conservatives", but it has nothing to do with their values. Their values are Libertarian. More like Democrat than Republican. Ryan made sure Trump got NO SUPPORT from his leadership, but gave Obama EVERYTHING he wanted and more. Just look at the 2015 Omnibus he authored. (10) Ryan’s Omnibus Failed to Allocate Funds to Complete the 700-Mile Double-Layer Border Fence That Congress Promised the American People. If Ryan was a true Republican the Wall would have been built and Obamacare would have been repealed and replaced within months of Trump taking office. But he's fought against the Trump agenda from beginning to end, and McCarthy/Scalise are just RINO Ryan clones. Jim Jordan is the ONLY answer for Republican values and working w/the Trump agenda. Will never happen with RINO's.